Freedom Network [FN] is alarmed at speed the electronic media regulatory body PEMRA is suspending lincences of free-to-air private independent news and entertainment channels as viewers will no longer watch news on ARY News and plays on Geo Entertainment channels. “A ban on media, even for short periods, constitutes an extreme response to perceived violations of any existing laws. The banning of three TV channels – Geo News, Geo Entertainment and ARY News – within a space of three weeks amounts to an escalation in the coercion that the state of Pakistan is exercising on the media,” FN, Pakistan’s first media watchdog organization, said Sunday (June 22, 2014) in its press freedom alert. PEMRA (Pakistan Electronic Media Regulatory Authority) suspended on Friday (June 20, 2014) the licenses of private TV channels Geo Entertainment and ARY News for what it called “violations” of code of conduct. “Unlike any other commercial enterprise, independent media is the watchdog of public interest and banning channels – like the three channels have been banned by PEMRA for a period of 15 and 30 days respectively through a suspension of their license for this period – only serves to optimally restrict public’s interests through a platform of freedom of expression and right to information,” FN alert added. The press freedom watchdog organization went on to say that the extreme measures taken by PEMRA to ban channels for 15 and 30 days respectively on charges of alleged treason, blasphemy and violation of code of conducts “demonstrate the coercive nature of the media regulatory regime of Pakistan, enacted by a non-elected ruler in the early 2000s. PEMRA announced on Friday (June 20, 2014) that Geo Entertainment channel, part of Geo Network, was slapped with a one month suspension along with Rs.10 million fine while the license of ARY News for 15 days and a similar fine. The move comes hours before Geo News channel returned to Pakistani airwaves on June 21, 2014, from 15 days licence suspension by PEMRA on June 6, 2014, after the channel alleged that the military-led ISI intelligence network was behind the attack on senior TV anchor Hamid Mir in Karachi on April 19 this year. Mubashar Luqman, anchoring talk-show on ARY News channel, was already barred by a Islamabad High Court order from hosting any show till further order while taking up a petition from an individual who prayed the court to ban the channel after the anchor allegedly tried to “malign” the higher judiciary in his shows. 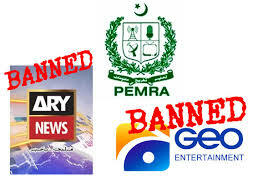 Geo Entertainment license was suspended for airing “blasphemous content” on one of its morning shows while ARY News was handed the license suspension over complaints that it had made slanderous statements against the judiciary on one of its shows. ARY News continues its coverage of national and international news interesting its viewers both inside and outside the country making itself available on Internet and its website – www.arynews.tv – is accessible despite the channel’s licence suspension. ARY News has been rivaling Geo News after allegation that the ISI plotted the attack on Hamid Mir. A report on its website read that Prime Minister Nawaz Sharif had “ordered” the PEMRA to cancel the channel’s licence.